The Practice has on-site access to Language Line, a foreign language interpreting service. If required, we can also arrange for a foreign language interpreter to accompany patients via the Community Development Department of Aberdeen City Council, and sign language interpreter via North East Sensory Services. We have consulting rooms on the ground and first floors of the building. We recognise that the layout of our building is not perfect for some of our patients. 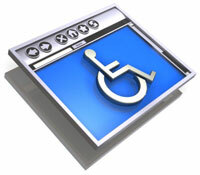 Patients who have difficulty with stairs, or who are in a wheelchair, are seen in the ground floor consulting rooms. Please advise the Receptionist when making your appointment if you need to be seen on the ground floor so that we can make the necessary arrangements. There is a designated disabled parking space at the front of the building. A toilet for the disabled is also available on the ground floor. A hearing loop is available at the Reception Desk for people using a hearing aid. A portable hearing loop is available for use in Consulting Rooms.